Ref: Henry Purcell. The harpsichord master. London: I. Walsh, 1697. The Harpsichord Master had been referred to in several written works about Purcell but no one really knew exactly what it contained. In fact, no copies were thought to have survived. When this unique volume of The Harpsichord Master was discovered at Auckland Public Library in 1978 by library assistant Robert Petre, there was much excitement in the musicological community around the world. The item was donated to Auckland Libraries by Mr Claude Philip Gyon Purchas in March 1937. However, we do not how it ended up in New Zealand, 300 years after it was first published. A very exciting part of the discovery was that it contained two otherwise unknown works by Purcell. Also represented are pieces by some of the less renowned English composers of this time: Jeremiah Clarke, Thomas Morgan, John Barrett and Robert King. Subsequent to the Auckland Public Library’s unique discovery, a new edition of the book was compiled by Petre and published in 1980. In his introduction, Petre describes the first piece in The Harpsichord Master as one of the most interesting because it appears to have Purcell’s own fingerings which are quite different to current practice. Also, there are quite a number of annotations throughout the book which all have some sort of nautical association. It seems natural to think that one of the book’s owners had a strong connection to the sea. Perhaps the notes and tunes were added on board ship at some time? Auckland Central City Library is pleased to announce that on the 23 August 2018 maestro Peter Watts will give a performance of The Harpsichord Master as part of the Library’s Thursday Heritage Concerts – Spring Series. Peter will be performing on his own harpsichord and talking about the instrument, its development and The Harpsichord Master. The score will be on display for the month of August in the Sir George Grey Special Collections Reading Room at the Central City Library. 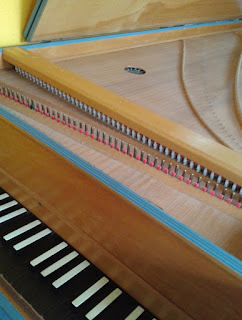 Peter’s instrument was made in Wellington and is a copy, by Zuckerman, of an early 17th century Flemish single manual harpsichord after the design of Ruckers. Andreas Ruckers, based in Antwerp, was one of the most important Flemish harpsichord makers.